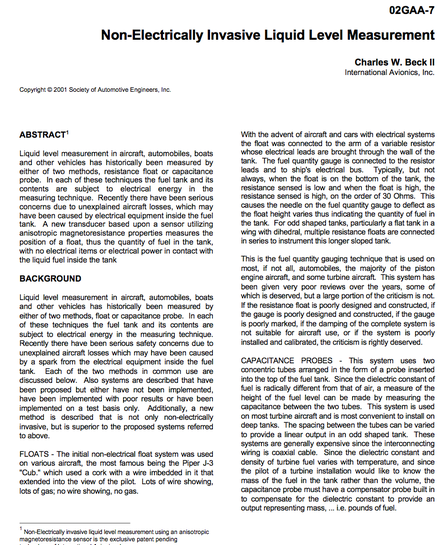 Fuel Level SAE Whitepapers - CiES Inc.
Two Technical Papers were published by the SAE for utilizing magneto resistive sensors to measure fuel quantity. These papers illustrate the many variations that can be accomplished utilizing magneto resistive sensors to measure fuel or other liquid. Liquid level measurement in aircraft, automobiles, boats and other vehicles has historically been measured by either of two methods, resistance float or capacitance probe. In each of these techniques the fuel tank and its contents are subject to electrical energy in the measuring technique. Recently there have been serious concerns due to unexplained aircraft losses, which may have been caused by electrical equipment inside the fuel tank. A new transducer based upon a sensor utilizing anisotropic magnetoresistance properties measures the position of a float, thus the quantity of fuel in the tank, with no electrical items or electrical power in contact with the liquid fuel inside the tank. 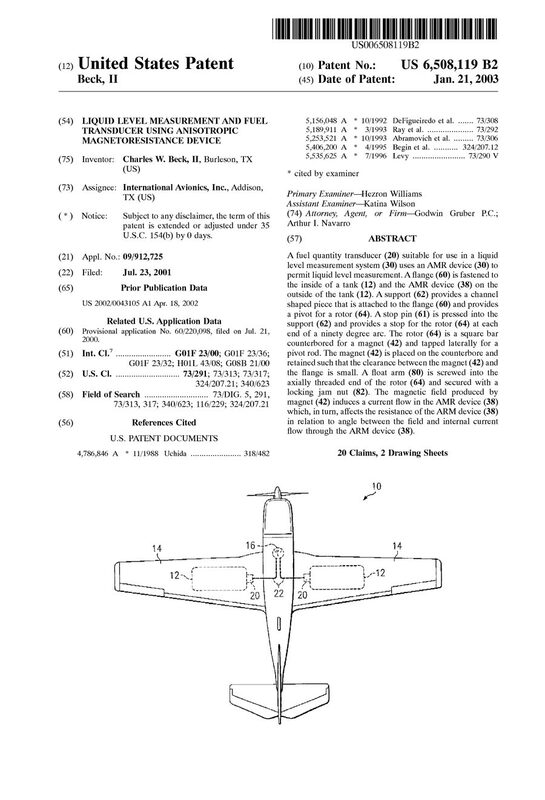 Unexplained aircraft losses, which may have been caused by electrical equipment inside the fuel tank initiating an explosion, have prompted the development of an electrically isolated Fuel Quantity Indicating System (FQIS). A liquid level transducer utilizing anisotropic magnetoresistance properties to measure the quantity of fuel in a tank with no electrical items or electrical power in contact with the liquid fuel inside the tank was introduced in April 2002 at the Society of Automotive Engineers, General Aviation Technical Conference 2002, in Wichita, Kansas. A magnetoresistive sensor measures the angle of a magnetic field that rotates as a function of the position of a float, thus indicating the quantity of fuel in the tank. More than a laboratory curiosity, this transducer has been continuously developed to make it more reliable, easier to produce, and thus less costly. This paper provides an update to the original paper, 02GAA-7, Non-Electrically Invasive Liquid Level Measurement, discussing design improvements, installation requirements, and installation data. Additional applications such as quantity measurement of potable water, quantity measurement of conductive liquids, and non-contacting position transducers are discussed. A fuel quantity transducer (20) suitable for use in a liquid level measurement system (30) uses an AMR device (30) to permit liquid level measurement. A flange (60) is fastened to the inside of a tank (12) and the AMR device (38) on the outside of the tank (12). A support (62) provides a channel shaped piece that is attached to the flange (60) and provides a pivot for a rotor (64). A stop pin (61) is pressed into the support (62) and provides a stop for the rotor (64) at each end of a ninety degree arc. The rotor (64) is a square bar counterbored for a magnet (42) and tapped laterally for a pivot rod. The magnet (42) is placed on the counterbore and retained such that the clearance between the magnet (42) and the flange is small. A float arm (80) is screwed into the axially threaded end of the rotor (64) and secured with a locking jam nut (82). The magnetic field produced by magnet (42) induces a current flow in the AMR device (38) which, in turn, affects the resistance of the ARM device (38) in relation to angle between the field and internal current flow through the ARM device (38).